This article is about the weather phenomenon. For other uses, see Lake Effect. Lake-effect snow is produced during cooler atmospheric conditions when a cold air mass moves across long expanses of warmer lake water. The lower layer of air, heated up by the lake water, picks up water vapor from the lake and rises up through the colder air above; the vapor then freezes and is deposited on the leeward (downwind) shores. The areas affected by lake-effect snow are called snowbelts. These include areas east of the Great Lakes, the west coasts of northern Japan, the Kamchatka Peninsula in Russia, and areas near the Great Salt Lake, Black Sea, Caspian Sea, Baltic Sea, and the Adriatic Sea. Lake-effect blizzards are the blizzard-like conditions resulting from lake-effect snow. Under certain conditions, strong winds can accompany lake-effect snows creating blizzard-like conditions; however the duration of the event is often slightly less than that required for a blizzard warning  in both the US and Canada. If the air temperature is low enough to keep the precipitation frozen, it falls as lake-effect snow. If not, then it falls as lake-effect rain. For lake-effect rain or snow to form, the air moving across the lake must be significantly cooler than the surface air (which is likely to be near the temperature of the water surface). Specifically, the air temperature at an altitude where the air pressure is 850 millibars (85 kPa) (roughly 1.5 kilometers or 0.93 miles vertically) should be 13 °C (23 °F) lower than the temperature of the air at the surface. Lake-effect occurring when the air at 850 millibars (85 kPa) is much colder than the water surface can produce thundersnow, snow showers accompanied by lightning and thunder (caused by larger amounts of energy available from the increased instability). Lake-effect snow is produced as cold winds blow clouds over warm waters. There are some key elements that are required to form lake-effect precipitation and which determine its characteristics: instability, fetch, wind shear, upstream moisture, upwind lakes, synoptic (large)-scale forcing, orography/topography, and snow or ice cover. A temperature difference of 13 °C (23 °F) (or as past researchers have estimated: between 15 °C and 25 °C) between the lake temperature and the height in the atmosphere (~1,500 meters or 4,900 feet at which barometric pressure measures 850 millibars (85 kilopascals)) provides for absolute instability and allows vigorous heat and moisture transportation vertically. Atmospheric lapse rate and convective depth are directly affected by both the mesoscale lake environment and the synoptic environment; a deeper convective depth with increasingly steep lapse rates and a suitable moisture level will allow for thicker, taller lake effect precipitation clouds and naturally a much greater precipitation rate. The distance that an air mass travels over a body of water is called fetch. Because most lakes are irregular in shape, different angular degrees of travel will yield different distances; typically a fetch of at least 100 km (62 mi) is required to produce lake effect precipitation. Generally, the larger the fetch the more precipitation that will be produced. Larger fetches provide the boundary layer with more time to become saturated with water vapor and for heat energy to move from the water to the air. As the air mass reaches the other side of the lake, the engine of rising and cooling water vapor pans itself out in the form of condensation and falls as snow, usually within 40 kilometers (25 miles) of the lake but sometimes up to about 100 miles. Directional shear is one of the most important factors governing the development of squalls; environments with weak directional shear typically produce more intense squalls than those with higher shear levels. If directional shear between the surface and the height in the atmosphere at which the barometric pressure measures 700 mb (70 kPa) is greater than 60 degrees, nothing more than flurries can be expected. If the directional shear between the body of water and the vertical height at which the pressure measures 700 mb (70 kPa) is between 30 and 60 degrees, weak lake-effect bands are possible. In environments where the shear is less than 30 degrees, strong, well organized bands can be expected. Speed shear is less critical, but should be relatively uniform. The wind speed difference between the surface and vertical height at which the pressure reads 700 mb (70 kPa) should be no greater than 40 knots (74 km/h) so as to prevent the upper portions of the band from shearing off. However, assuming the surface to 700 mb (70 kPa) winds are uniform, a faster overall velocity will work to transport moisture quicker from the water, and the band will travel much farther inland. Temperature difference and instability are directly related, the greater the difference the more unstable and convective the lake effect precipitation will be. A lower upstream relative humidity will make it more difficult and time consuming for lake effect condensation, clouds and precipitation to form. The opposite is true if the upstream moisture has a high relative humidity, allowing lake effect condensation, cloud and precipitation to form more readily and in a greater quantity. Any large body of water upwind will impact lake-effect precipitation to the lee of a downwind lake by adding moisture or pre-existing lake-effect bands, which can re-intensify over the downwind lake. Upwind lakes do not always lead to an increase of precipitation downwind. Typically lake-effect precipitation will increase with elevation to the lee of the lake as topographic forcing squeezes out precipitation and dries out the squall much faster. As a lake gradually freezes over, its ability to produce lake-effect precipitation decreases for two reasons. Firstly, the open ice-free liquid surface area of the lake shrinks. This reduces fetch distances. Secondly, the water temperature nears freezing, reducing overall latent heat energy available to produce squalls. To end the production of lake-effect precipitation, a complete freeze is often not necessary. Even when precipitation is not produced, cold air passing over warmer water may produce cloud cover. Fast moving mid-latitude cyclones, known as Alberta clippers, often cross the Great Lakes. After the passage of a cold front, winds tend to switch to the northwest, and a frequent pattern is for a long-lasting low-pressure area to form over the Canadian Maritimes, which may pull cold northwestern air across the Great Lakes for a week or more, commonly identified with the negative phase of the North Atlantic Oscillation (NAO). Since the prevailing winter winds tend to be colder than the water for much of the winter, the southeastern shores of the lakes are almost constantly overcast, leading to the use of the term The Great Gray Funk as a synonym for winter. These areas allegedly contain populations that suffer from high rates of seasonal affective disorder, a type of psychological depression thought to be caused by lack of light. Cold winds in the winter typically prevail from the northwest in the Great Lakes region, producing the most dramatic lake-effect snowfalls on the southern and eastern shores of the Great Lakes. This lake-effect produces a significant difference between the snowfall on the southern/eastern shores and the northern and western shores of the Great Lakes. The most affected areas include the Upper Peninsula of Michigan, Central New York, Western New York, Northwestern Pennsylvania, Northeastern Ohio, southwestern Ontario and central Ontario, Northeastern Illinois (along the shoreline of Lake Michigan), northwestern and north central Indiana (mostly between Gary and Elkhart), northern Wisconsin (near Lake Superior), and West Michigan. Tug Hill in New York's North Country region has the 2nd most snow amounts of any non-mountainous location within the continental U.S., only trailing the Upper Peninsula, which can average over 200 inches (508 centimeters) of snow per year. Lake-effect snows on the Tug Hill plateau (east of Lake Ontario) can frequently set daily records for snowfall in the United States. Tug Hill receives, on average, over 20 feet (240 in; 610 cm) of snow each winter. In February 2007, a prolonged lake-effect snow event left 141 inches (358 cm) of snow on the Tug Hill Plateau. Syracuse, New York, directly south of the Tug Hill Plateau, receives significant lake-effect snow from Lake Ontario, and averages 115.6 inches (294 cm) of snow per year, which is enough snowfall to be considered one of the "snowiest" large cities in America. A small amount of lake-effect snow from the Finger Lakes falls in upstate New York as well. If the wind blows almost the entire length of either Cayuga Lake or Seneca Lake, Ithaca or Watkins Glen respectively can have a small lake effect snow storm. Lake Erie produces a similar effect for a zone stretching from the eastern suburbs of Cleveland through Erie to Buffalo. Remnants of lake-effect snows from Lake Erie have been observed to reach as far south as Garrett County, Maryland and as far east as Geneva, New York. Because it's not as deep as the other lakes, Erie warms rapidly in the spring and summer and is frequently the only Great Lake to freeze over in winter. Once frozen, the resulting ice cover alleviates lake-effect snow downwind of the lake. Based on stable isotope evidence from lake sediment coupled with historical records of increasing lake effect snow, it has been predicted that Global Warming will result in a further increase in lake effect snow. A very large snowbelt in the United States exists on the Upper Peninsula of Michigan, near the cities of Houghton, Marquette, and Munising. These areas average 250–300 inches (635–762 cm) of snow each season. For comparison, on the western shore, Duluth, Minnesota receives 78 inches (198 cm) per season. Lake Superior and Lake Huron rarely freeze because of their size and depth; hence, lake-effect snow can fall continually in the Upper Peninsula and Canadian snowbelts during the winter months. Main areas of the Upper Peninsula snow belt include the Keweenaw Peninsula and Baraga, Marquette and Alger counties, where Lake Superior contributes to lake-effect snow, making them a prominent part of the Midwestern snow belt. Records of 390 inches (991 cm) of snow or more have been set in many communities in this area. The Keweenaw Peninsula averages more snowfall than almost anywhere in the United States—more than anywhere east of the Mississippi River and the most of all non-mountainous regions of the continental United States. Because of the howling storms across Lake Superior, which cause dramatic amounts of precipitation, it has been said that the lake-effect snow makes the Keweenaw Peninsula the snowiest place east of the Rockies. Only one official weather station exists in this region. Located in Hancock, Michigan, this station averages well over 210 inches (533 cm) per year. Farther north in the peninsula, lake-effect snow can occur with any wind direction. The road commission in Keweenaw County, Michigan collects unofficial data in a community called Delaware, and it strictly follows the guidelines set forth by the National Weather Service. This station averages over 240 inches (610 cm) per season. Even farther north, a ski resort called Mount Bohemia receives an unofficial annual average of 273 inches (693 cm). Herman, Michigan, averages 236 inches (599 cm) of snow every year. Lake-effect snow can cause blinding whiteouts in just minutes, and some storms can last days. 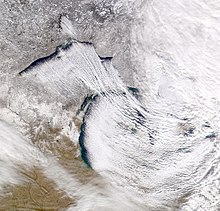 Western Michigan, western Northern Lower Michigan, and Northern Indiana can get heavy lake-effect snows as winds pass over Lake Michigan and deposit snows over Muskegon, Traverse City, Grand Rapids, Kalamazoo, New Carlisle, South Bend, and Elkhart, but these snows abate significantly before Lansing or Fort Wayne, Indiana. When winds become northerly, or aligned between 330 and 390 degrees, a single band of lake-effect snow may form, which extends down the length of Lake Michigan. This long fetch often produces a very intense, yet localized, area of heavy snowfall, affecting cities such as Laporte and Gary. Lake-effect snow is uncommon in Detroit, Toledo, Milwaukee, and Chicago, because the region's dominant winds are from the northwest, making them upwind from their respective Great Lakes. However, they too can see lake-effect snow during easterly or north-easterly winds. More frequently, the north side of a low-pressure system picks up more moisture over the lake as it travels west, creating a phenomenon called lake-enhanced precipitation. Fulton, New York after a snowburst dropped 4–6 feet (122–183 cm) of snow over most of Oswego County January 28–31, 2004. The Veteran's Day storm of November 9–14, 1996 may be the most severe early season lake effect snow (LES) storm the Great Lakes has witnessed in the past fifty years. At the height of the storm, over 160,000 customers were without power in Greater Cleveland alone, as the storm produced isolated snowfall tallies approaching 70 inches (178 cm). Visible satellite image showing a large single lake-effect band from Lake Huron with vigorous vertical motion. This band produced 8 inches (20 cm) of snow in the eastern and northern suburbs of Toronto, Ontario. Because Southwestern Ontario is surrounded by water on three sides, many parts of Southwestern and Central Ontario get a large part of their winter snow from lake-effect snow. This region is notorious for the whiteouts which can suddenly reduce highway visibility on the world's busiest highway (Ontario Highway 401) from clear to zero. The region most commonly affected spans from Port Stanley in the west, the Bruce Peninsula in the north, Niagara-on-the-Lake to the east, and Fort Erie to the south. The heaviest accumulations usually happen in the Bruce Peninsula, which is between Lake Huron and Georgian Bay. So long as the Great Lakes are not frozen over, the only time the Bruce Peninsula does not get lake-effect snow is when the wind is directly from the south. Toronto and Hamilton are usually spared lake-effect squalls because they are not on the leeward side of Lake Ontario during the dominant northwest winds. However, some central and northern portions of the Greater Toronto Area can be affected a few times each year by lake-effect snow from Georgian Bay. Downtown Toronto and Hamilton get most of their lake-effect snow when the wind comes from the southeast or east, over Lake Ontario. Such easterly winds are usually associated with a winter cyclone passing just to the south of the Great Lakes. When the wind is from the north, the snowbelt runs north-south from Grand Bend to Sarnia and London. Areas such as Lucan and Kincardine have experienced some of the heaviest snowsqualls from Lake Huron in this region. When the wind is slightly more westerly, the snowbelt runs from Tobermory, Owen Sound, and Grand Bend to as far south and east as Arthur, Orangeville and Caledon. This snowbelt often reaches Kitchener and can affect the Halton and Peel regions of the Greater Toronto Area. These northwesterly winds usually also bring snow southeast of Georgian Bay, which can reach beyond Lake Scugog. A westerly wind sends lake-effect streamers east from Owen Sound to Gravenhurst, Barrie, and Orillia, and may even reach as far south and east as York Region in the Greater Toronto Area. When the wind is from the southwest, lake-effect streamers from Lake Huron and Georgian Bay run from Noelville to Sudbury, Gravenhurst, and Algonquin Provincial Park. Winds from this same direction coming over Lake Ontario will cause squalls to come ashore from Cobourg through the Belleville area to Kingston and the Thousand Islands, with Prince Edward County being the area most vulnerable to extreme snowfall amounts. Some snow bands can occasionally reach Quebec and Maine, while snow originating from Lake Erie, Lake Ontario and even Lake Michigan can impact southern Ontario. Easterly winds primarily affect the Niagara Peninsula. Local lake-effect snowsqualls can occasionally occur downwind of Lake Simcoe when the lake is unfrozen, usually in early winter or late fall. Lake Superior has its own independent snowbelts, affecting Wawa, Sault Ste. Marie, Marathon, the Keweenaw Peninsula in Upper Michigan, and Pukaskwa National Park. Thunder Bay is usually not affected by lake-effect snow, unless it is associated with a winter storm. The southern and southeastern sides of the Great Salt Lake receive significant lake-effect snow. Since the Great Salt Lake never freezes, the lake effect can influence the weather along the Wasatch Front year-round. The lake effect largely contributes to the 55–80 inches (140–203 cm) annual snowfall amounts recorded south and east of the lake, and in average snowfall reaching 500 inches (13 m) in the Wasatch Range. The snow, which is often very light and dry because of the semi-arid climate, is referred to as "The Greatest Snow on Earth" in the mountains. Lake-effect snow contributes to approximately 6–8 snowfalls per year in Salt Lake City, with approximately 10% of the city's precipitation being contributed by the phenomenon. Similar snowfall can occur near large inland bays, where it is known as bay-effect snow. Bay-effect snows fall downwind of Delaware Bay, Chesapeake Bay, and Massachusetts Bay when the basic criteria are met, and on rarer occasions along Long Island. The Finger Lakes of New York are long enough for lake-effect precipitation. The Texas twin cities of Sherman and Denison are known, in rare instances, to have experienced lake-effect snow from nearby Lake Texoma due to the lake's size (it is the third-largest lake in Texas or along its borders). On one occasion in December 2016, lake effect snow fell in central Mississippi from a lake band off Ross Barnett Reservoir. Oklahoma City even saw a band of lake effect snow off of Lake Hefner in February 2018. The Truckee Meadows and other parts of Northern Nevada which are normally in the rain shadow of the Sierra Nevada can, when conditions are right, have severe snowfall as a result of lake effect from Lake Tahoe. Recent severe examples of this phenomenon have occurred as recently as 2004, dumping several feet of snow in the normally dry region. The West Coast occasionally experiences ocean-effect showers, usually in the form of rain at lower elevations south of about the mouth of the Columbia River. These occur whenever an Arctic air mass from western Canada is drawn westward out over the Pacific Ocean, typically by way of the Fraser Valley, returning shoreward around a center of low pressure. Cold air flowing southwest from the Fraser Valley can also pick up moisture over the Strait of Georgia and Strait of Juan de Fuca, then rise over the northeastern slopes of the Olympic Mountains, producing heavy, localized snow between Port Angeles and Sequim, as well as areas in Kitsap County and the Puget Sound region. Lake Winnipeg and Lake Winnipegosis in Manitoba historically have seen lake-effect snow as early as late October, and it is common throughout early to mid November. Towards the end of November the lakes sufficiently cool and begin to freeze ending the lake effect snow. A brief period of lake-effect snow is also common near Great Bear Lake and Great Slave Lake in the Northwest Territories during early winter (usually early to mid October); however the lake-effect season for both lakes is very short. The lakes are frozen roughly eight months of the year and as a result have very little time to warm during the summer months. Other small lakes such as Lake Athabasca in northern Saskatchewan and Lake Nipigon in northwestern Ontario produce early season lake-effect snows. Smallwood Reservoir, a man-made lake located in Labrador has on occasion generated lake-effect snow. The Canadian Maritimes, specifically Nova Scotia and Prince Edward Island, are often affected by such snow squalls when an Arctic winter airmass moves over unfrozen waters. In PEI, sea-effect snow is often generated when a cold north wind blows over the unfrozen Gulf of St. Lawrence, dumping heavy snow on the north shore. In Nova Scotia, a cold north-west wind can produce sea-effect snow over the Cape Breton Highlands from the Gulf of St. Lawrence, and the Annapolis Valley from the Bay of Fundy; in the latter case, the sea-effect snow season can continue all winter as the Bay of Fundy remains open owing to its extreme tidal currents. The east coast of southern Vancouver Island, British Columbia, experiences occasional episodes of sea-effect snow during winter months due to cold easterly outflow winds from the British Columbia interior, typically through the Fraser Valley, crossing the always open waters of the Strait of Georgia. Lake-effect or sea-effect snow occurs in other countries, near large lakes or large sea areas. In Eurasia, it occurs in the regions of the Black Sea in Georgia and Turkey, the Caspian sea in Iran, the Adriatic Sea in Italy, the North Sea, as well as the Irish Sea and the Aegean Sea, the Balearic Islands, the Baltic Sea as well as areas surrounding the Sea of Japan. Because the southern Black Sea is relatively warm (around 13 °C or 55 °F at the beginning of winter, typically 10 to 6 °C or 50 to 43 °F by the end), sufficiently cold air aloft can create significant snowfalls in a relatively short period of time. Due to its location on a peninsula between the Black Sea and the Sea of Marmara, Istanbul is very prone to lake-effect snow and this weather phenomenon occurs almost every winter. This type of precipitation is generated by the warmer Black Sea temperature and colder air temperature, over the Istanbul area. In February 2005, a lake-effect snowfall left 50 centimeters (20 in) of snow, and in March 1987, a three-week-long lake-effect snowfall accompanied with strong winds (lake-effect blizzard) left 80 centimeters (31 in) of snow in Istanbul. The snowfall in the eastern regions of the Black Sea is amplified by the orographic effect of the nearby Caucasus Mountains, often resulting in snowfall of several meters, especially at higher elevations. In Northern Europe, cold, dry air masses from Russia can blow over the Baltic Sea and cause heavy snow squalls on areas of the southern and eastern coasts of Sweden, as well as on the Danish island of Bornholm and the east coast of Jutland. The Sea of Japan creates snowfall in the mountainous western Japanese prefectures of Niigata and Nagano, parts of which are known collectively as Snow country ("Yukiguni"). In addition to the Sea of Japan, other parts of Japan, as well as Korea and Scandinavia, experience these same conditions. Because the Aegean Sea (Greece), is warm in the winter, when cold air masses from Siberia advance in the area, they pick up lots of moisture, resulting in heavy snowfalls in eastern Central Greece, eastern Thessaly, eastern Peloponnese, south-eastern Chalkidiki, the Cyclades and Crete (more commonly in the mountainous areas). In 2008 a severe snowstorm blanketed Athens dropping 40 cm of snow and causing huge traffic jams. Chart showing the sea effect snow event of January 1987 in the UK. A continuous stream of showers deposited over 2 feet (24 in) of snow over SE coastal regions. NetWeather radar image showing "lake-effect" snow over Kent and northeast England. In the United Kingdom, easterly winds bringing cold continental air across the North Sea can lead to a similar phenomenon. Locally it is also known as "lake-effect snow" despite the snow coming in from the sea rather than a lake. Similarly during a north-westerly wind, snow showers can form coming in from the Liverpool Bay, coming down the Cheshire gap, causing snowfall in the West Midlands—this formation resulted in the white Christmas of 2004 in the area, and most recently the heavy snowfall of 8 December 2017 and 30 January 2019. A similar phenomenon can affect the city of Inverness in the Scottish Highlands, where cold north east winds cause heavy snow to form in the Moray Firth; this was the case with the White Hogmanay of 2009, which caused the street party to be canceled. Northerly and north-westerly winds can cause the effect to occur over the Irish Sea and Bristol Channel feeding snow into south-west England and Eastern Ireland. Western Scotland and the Northern Ireland can also see snow showers from a north or north-westerly wind over the Atlantic. Since the North Sea is relatively warm (around 13 °C or 55.4 °F at the beginning of winter, typically 10 to 6 °C or 50 to 43 °F by the end), sufficiently cold air aloft can create significant snowfalls in a relatively short period of time. The best-known example occurred in January 1987, when record-breaking cold air (associated with an upper low) moved across the North Sea towards the UK. The end result was over two foot of snow for coastal areas, leading to communities being cut off for over a week. The latest of these events to affect Britain's east coast occurred on November 30, 2017, February 28, 2018 and 17 March 2018 in connection with the 2018 Great Britain and Ireland cold wave. The 2nd event of Winter 2017/18 was particularly severe, with up to 27.5 inches (70 cm) falling in total over the 27th-28th. Similarly, northern winds blowing across the relatively warm waters of the English Channel during cold spells can bring significant snowfall to the French region of Normandy, where snow drifts exceeding ten feet (3 m) were measured in March 2013. ^ "NOAA – National Oceanic and Atmospheric Administration – Monitoring & Understanding Our Changing Planet". ^ "Instability". Archived from the original on 2009-06-17. ^ "Fetch". Archived from the original on 2008-05-15. ^ a b "Wind Shear". Archived from the original on 2008-05-11. ^ "Upstream Moisture". Archived from the original on 2008-05-09. ^ "Upstream Lakes". Archived from the original on 2008-05-09. ^ "Synoptic-Scale Forcing". Archived from the original on 2008-05-16. ^ "Orography/Topography". Archived from the original on 2008-05-09. ^ "Snow/Ice Cover on the Great Lakes". Archived from the original on 2008-05-15. ^ "Mean Monthly and Annual Snowfall for the Conterminous United States". Archived from the original on 2008-06-09. ^ Northern Forest Alliance. "Tug Hill Plateau – New York". www.northernforestalliance.org. Archived from the original on May 9, 2008. Retrieved February 1, 2015. ^ National Climatic Data Center. Climate of 2007 – February in Historical Perspective. Retrieved on 2008-03-01. ^ Thomas W. Schmidlin. Climatic Summary of Snowfall and Snow Depth in the Ohio Snowbelt at Chardon. Retrieved on 2008-03-01. ^ Northeast Regional Climate Center. February Brings Winter Weather to the Northeast. Archived 2007-06-11 at the Wayback Machine Retrieved on 2008-03-01. ^ Great Lakes Information Network. 6 | Introduction to the Great Lakes. Retrieved on 2008-03-01. ^ Burnett, Adam W.; Kirby, Matthew E.; Mullins, Henry T.; Patterson, William P. (2003). "Increasing Great Lake–Effect Snowfall during the Twentieth Century: A Regional Response to Global Warming?". Journal of Climate. 16 (21): 3535–3542. doi:10.1175/1520-0442(2003)016<3535:IGLSDT>2.0.CO;2. ^ Robert J. Ruhf. Lake-Effect Precipitation in Michigan. Retrieved on 2008-03-01. ^ University of Utah Department of Meteorology. Average Snowfall, Inches. Archived 2008-03-28 at the Wayback Machine Retrieved on 2008-03-01. ^ National Weather Service Office, Melbourne, Florida.Cold Temperatures and Snow Flurries in East-Central Florida January 24, 2003. Retrieved on 2006-11-05. ^ "سازمان هواشناسی :: Weather". ^ "Snow Blankets Iran : Natural Hazards". ^ "BBC News – Iran snow cuts power to nearly 500,000 homes". BBC News. ^ "Heavy Snow Kills Dozens in Asia". ^ "Iranians use Facebook to save villagers from snowstorm". The Observers. ^ "Weather Forecasts, News & More – Netweather.tv". ^ USW archives  Retrieved on 2007-08-03. ^ "Rouen. Neige. Le mois de mars de tous les records en Normandie « Article « Normandie-actu". Normandie-actu.